Since 1999, we’ve been at the forefront of Australian digital document management, back when it was known as a paperless office solution or electronic filing. You’ll find that we go beyond selling software, to deliver you a boutique business partnership with an Australian based expert who takes the time to fully understand your business workflow and filing needs. Stop searching, you’ve found a better document management solution. Your staff can say goodbye to heavy files, paper cuts, storage dust, and complicated spreadsheets of archives. You can say good riddance to that inefficient maze of Google Docs or Explorer folders. You can stop being held hostage by Dropbox. Make the choice to do better business with Info-Organiser. Info-Organiser Desktop provides robust document management installed on your hard drive or server and connected to every desktop or device in your network. Installation includes standard custom configuration. Info-Organiser Cloud stores your documents safely and securely in a hosted online environment. HTML 5, web-based, fully responsive theme that adapts to Apple, Samsung or Windows devices. For many businesses to operate at peak efficiency, document management must be an integral part of your entire business process. Info-Organiser’s fully integrated customised Application Interface (API) is a better working solution. Explore the Info-Organiser Product Comparison below. Info-Organiser Desktop provides robust document management installed on your hard drive or server and connected to everyone in your network. Info-Organiser Cloud stores your documents safely and securely in a hosted online environment. Web-based, fully responsive theme that adapts to Apple, Samsung or Windows devices. Choose web portal, terminal server access or stream to remote desktop. For many businesses to operate at peak efficiency, better document management must be an integral part of your entire business process. Info-Organiser’s fully integrated customised Application Interface (API) is a fully integrated solution. Since every business is unique, Info-Organiser is installed with a menu of customisable features that you can adjust to suit your needs. Standard Settings include Index Setup, Field Relationships, Screen Layout and Bulk Import. Standard customisation is provided with installation. Premium Features allow Email Filing, Workflow Scripts, Smart Invoices and Forms Processing integration. Info-Organiser Forms cleverly takes your digital filing to the next level by adding a end-to-end forms processing solution. Info-Organiser Forms provides automated, accurate capture of your unique data directly from any paper form or e-form. You receive maximised efficiency and almost instant return on investment! We want your experience of using Info-Organiser to be as simple and relaxed as possible. For some businesses the change to digital filing needs a measure of time to fully succeed. Staff require space to adopt new strategies, security settings evolve and require amendment, computers need upgrading and passwords get forgotten. InfoCare Support gives you peace of mind that you will receive fast response to any Info-Organiser related issues. Installation - You will find we give exceptional value during the initial scoping and configuration process – assisting you to identify your workflow needs and adapting a digital filing solution to fit the simplest or the most complex search and security requirements. Training – Your training is provided online and can be rolled out across your team in groups if needed. A follow up training after the first month of using Info-Organiser is highly recommended. 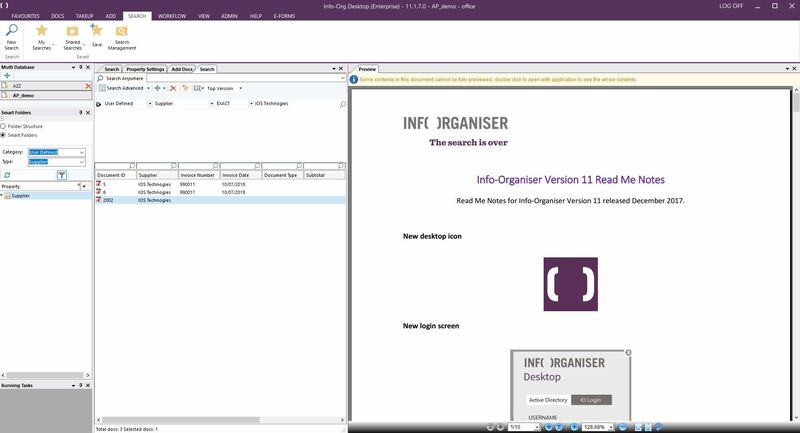 Over the last few years Info Organiser has been vital in our document management and recovery. It has allowed us to have thousands of important documents at our fingertips without spending endless hours sorting through archive boxes. The program has been easy to use and the team has been accommodating and supportive! Gulmohar Chemicals Pty Ltd is involved in the import and distribution of various farm chemicals. Our industry is governed by various government departments in Canberra and accessible record keeping is a must in order to comply with government regulations. Before implementing Info-Organiser systems we had literally walls of Box Files containing all documents of our imports and on the other hand sales to our clients. In addition to this all our registration documents had to be kept in accessible places. One registration with the Canberra departments consists of a 80-100cm high paper pile, and we are looking after a total of 45 registrations. Since implementing Info-Organiser, all of this is gone. All documentation for our order files purchase or sales is kept only until the time material is sold. Once sold all files are scanned into Info-Organiser and the original paper documents are destroyed. The very good search facilities in Info-Organiser make it easy to trace and print any of these documents if needed for quality or customs audits. For us as a small company having the possibility to get rid of “hard copies” has really “decluttered” our office. Villa Maria Catholic Homes has been using Info Organiser since 2004, and it provides electronic filing for our employee files, client files, and accounts payable invoices. Documents for the client files are scanned in-house and uploaded by staff as required, while due to the high volume of documents for the employee files and the accounts payable invoices, Info Organiser collect, scan, index and upload the documents into these 2 databases for us. Access to each database is separately controlled so that confidentiality of information can be maintained. Each database is separately indexed according to our requirements, and the indexes can be easily expanded or amended. Info Organiser is a very simple, useful and cost-effective tool to enable easy, controllable access to documentation, and removes the need to create and retain bulky paper files, and our expenditure on costly, off-site storage has significantly reduced. Info-Organiser has been a very successful system we implemented into our HR department 12 months ago. We have 580 employees and Info-Organiser scanned the existing files, so we did not have to complete the enormous task ourselves. With all those files gone, space saving is a big bonus. The implementation went smoothly and we are easily managing the ongoing process of scanning new starters and maintenance records. We find the system very user-friendly and the search function is efficient. We were also able to request additional modifications to suit our needs. Overall we are very happy with the product and would recommend Info-Organiser. Solving large scale building document load with auto and email filing. Using hotkeys for smarter MYOB bookkeeping and Centrelink workflow. Digital archiving to save space, meet compliance and increase profit. Saving time and increasing efficiency in project management. Wollongong Hospital custom solution for 20,000+ client files that ticks all boxes.